You know the feeling you get when there’s a task you should do but really don’t want to do because there’s something more unpleasant in the way? I’ve got that feeling these days thanks to a spare (cheap) set of wheels lined up in the garage. The problem is they’re dirty, the kind of dirty that doesn’t come off with detergents or All Purpose Cleaners, the kind of dirty that comes off in your hand and not in the wash. The kind of dirty you hope your daughter will never be. Inner barrel of the SP20 alloys. 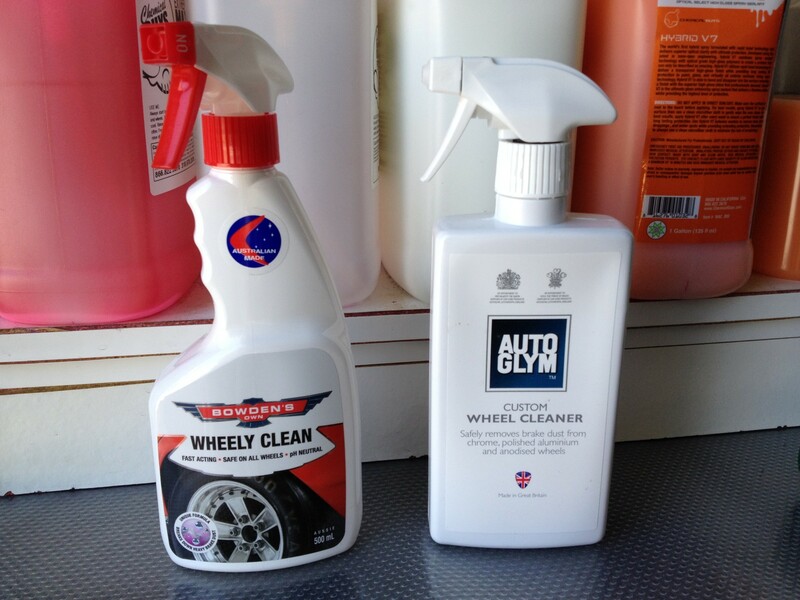 So what better opportunity to get some of the “off the shelf” wheel cleaners and have a go at comparing them. 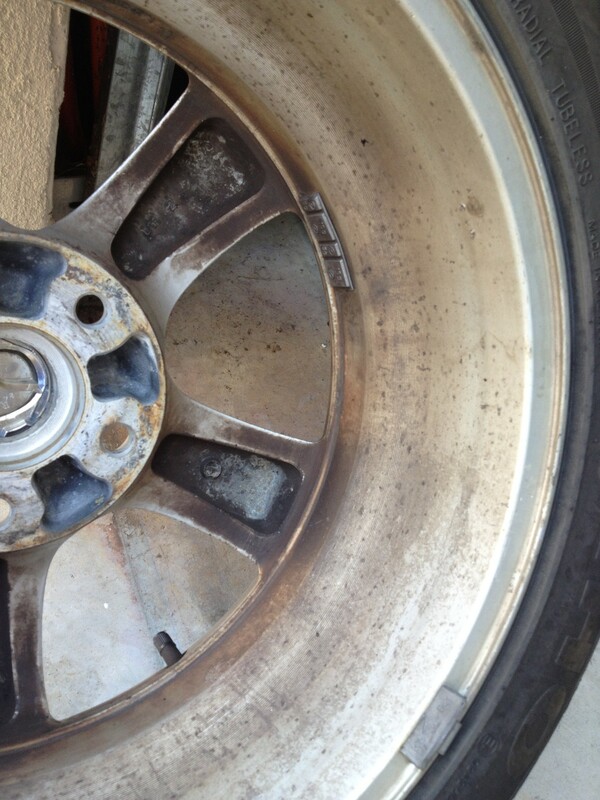 The best bit was these wheels need refinishing so any damage done wasn’t going to upset me. 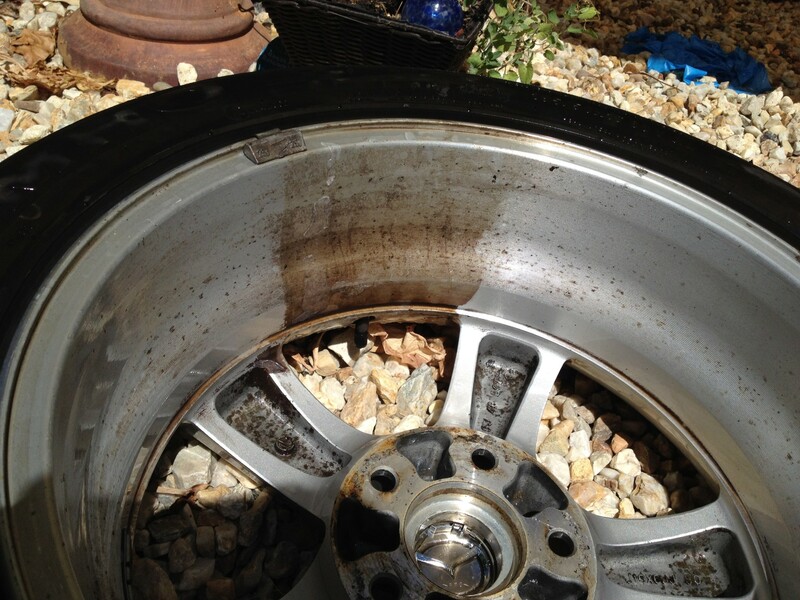 I’ve seen on forums talk of IronX and similar – decontamination chemicals that turn purple as they work – and when I read that Bowdens Own “Wheely Clean” did the same I was keen to try it. My other contender, from the UK was Autoglyms “Custom Wheel Cleaner”. 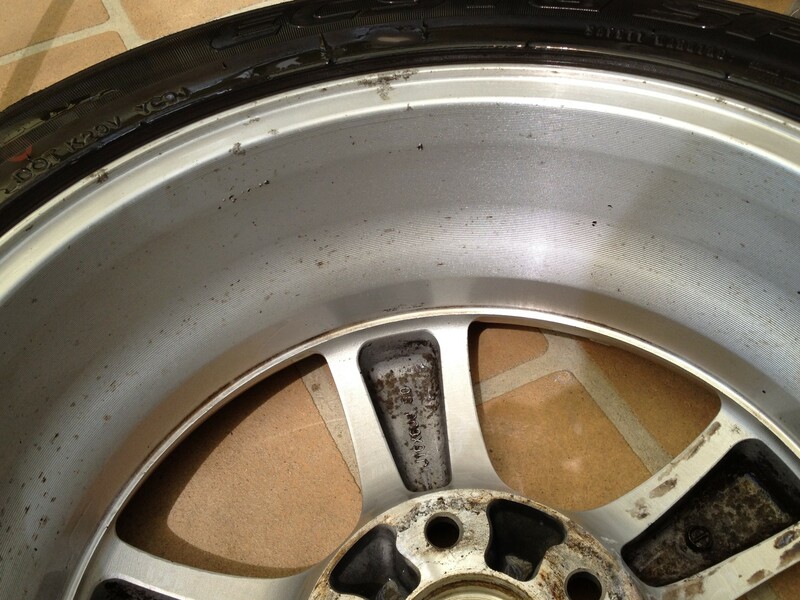 Both claim to not damage wheels or paintwork, both claim to strip away contamination, both claim to make the job easy. Bowdens Own and Autoglym wheel cleaners ready to do battle. The two products were bought from local resellers at/around their respective RRPs. They’re both just under AUD20 so neither is a “budget buy”. The easy bit – tape up a wheel into three sections, one for each brand and one “before” section. Use each product according to instructions, compare before and after. The best result wins. As the picture shows the Bowdens Own Wheely Clean has delivered a better result, neither product breaks down grease and tar effectively so a further cleaning process would be needed to deliver the best possible results. I believe the two products are quite evenly matched, however the Bowdens Own product instructions specify more agitation and soak time than the Autoglym. Naturally this will contribute to a better outcome. The Bowdens own product does turn purple, and while neither has the greatest scent the Bowdens really does get “on the nose”. If I was a betting person I’d be thinking Peroxide (as in hair bleach) is the key ingredient – maybe an experiment is in order. After the initial comparison I re-cleaned the entire wheel with Bowdens Own – again I doubt the results would be significantly different had I used the Autoglym – but the second clean was worth the effort. I have no doubt that every home detailer needs to have a product like these in their kit. The speed of the result and the overall ease of use lift them head and shoulders above scrubbing with with old-school soap products. The downside is cost, I’ve gone on to use these products in conjunction with my regular detailing and would say that 12 wheels is about the maximum you can expect to clean per bottle. I’d recommend using a wheel cleaner like these to break down heavy buildups of brake dust and and contamination, but for weekly washes I think you’ll find greater value in using a good set of cleaning tools and normal detergents. For my money I’ll be sticking with Bowdens Own – their wheel cleaner product works and it’s a great opportunity to support an Australian business that is bringing good products to market.